Kevin began playing saxophone and taking music lessons at the age of ten. 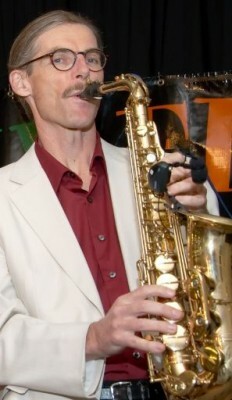 After high school, he attended Humber College in Toronto with a major in sax performance. After graduation he worked in bands throughout Calgary, Edmonton, San Diego and Phoenix. Along the way he managed several of his own bands and is currently a principal in SixFeetUp. Kevin also attended the Northern Alberta Institute of Technology (NAIT) in Edmonton completing his Electronics Engineering Technology diploma. With this in hand, he moved into the computer industry building his own computer networking company Tynetco Electronics. As well he was a computer instructor at NAIT for many years. This experience shaped his interest in computers and music and the idea of creating a band that would feature live vocals and horns with a rhythm section generated by the computer. Kevin tested the idea in a duo format with Gail and then when Bruce joined up about 10 years ago, SixFeetUp was born. In SixFeetUp Kevin plays Alto and Baritone Sax, Flute and Clarinet. Along with his work on stage, Kevin manages the business side of the band.